A shoe with a monk strap is similar in shape and construction to an Oxford but in place of an eyelet closure, the monk strap has a wide swath of leather fastened across the front of the shoe. This is the “strap,” which is fastened with either a single or double-buckle closure. The shoe takes its name from the monks who originally donned them. The simple closed-toe design provided greater protection than the sandals traditionally worn by men in the orders. How “formal” is a monk strap? All else being equal, the style itself lies somewhere between the Oxford and the derby. This classic alternative to laced dress shoes adds a certain panache to any outfit. 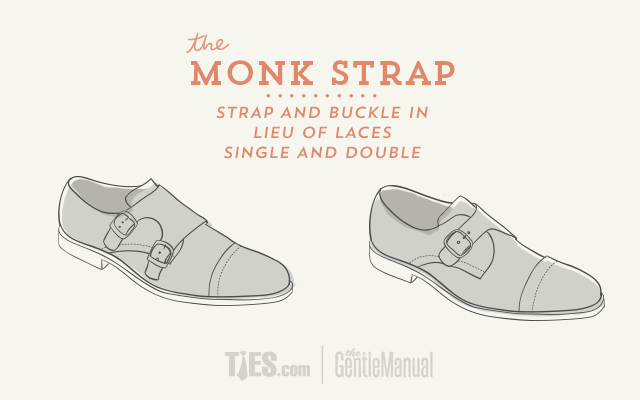 While this has not always been the case, the monk strap is now regarded as a very versatile style of shoe style. It can be worn with cuffed jeans, or with the most dapper of suits. Monk strap attracts attention and may at times become the focal point of an ensemble. Monk strap shoes are often crafted out of leather or suede, and will sometimes decorative broguing.